For a range of sovereign economic and geo-strategic reasons, Egypt should be concluding a deal with the IMF as soon as possible. 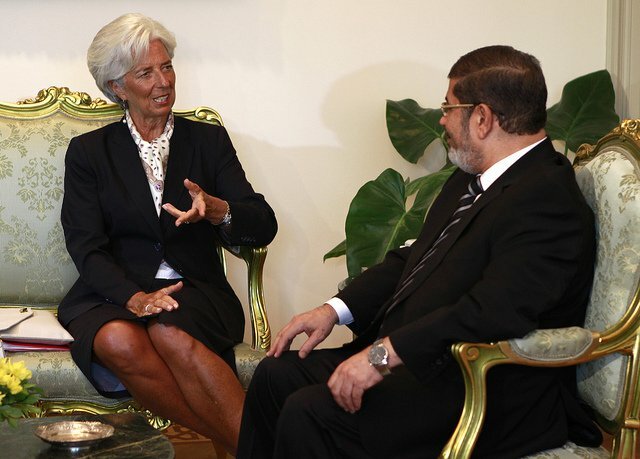 IMF Managing Director Christine Lagarde, left, and President of Egypt Mohamed Morsi, right. International Monetary Fund/Flickr. Some rights reserved. After weeks of talks between IMF negotiators and representatives of the Egyptian government in Cairo, and talks on the side of the semi-annual meeting of the IMF and World Bank in Washington D.C., the Egyptian government has yet to agree to IMF terms for at least a $4.8 billion loan. Securing a deal as soon as possible is vital. According to this author's interview with a former Director of the Middle East Central Asia Department at the IMF, IMF funding is becoming a firmer and more explicit condition for further funds from a variety of sources, ranging from the African Development Bank to the European Union – in some cases for up to $15 billion. However, as long as Qatar, Libya and Iraq are pledging separate investments, Egypt may not feel compelled to rapidly conclude a deal with the IMF. This would inevitably leave Egypt open to being more dependent on bilateral relations and higher financing costs. Apart from an $18 billion planned investment into Egypt through a host of tourism, oil and gas, and finance projects, Qatar is already getting a 5% return on its purchase of $3 billion worth of Egyptian bonds with an 18 month maturity, a return which it is unlikely to replicate anywhere else. There is also an additional, and hitherto unclear, foreign policy rationale for Qatari investment in Egypt at a critical time in the Middle East. Increasing Qatari influence in the region, leveraging Qatari foreign policies during the Arab Revolutions (Qatar supported NATO intervention in Libya), Islamism and support of the Muslim Brotherhood, and the conception of the Emir of Qatar, Sheikh Hamad bin Khalifa al-Thani, of his state’s regional role have all been posited. There have also been persistent rumours in Egypt of Qatari interest in purchasing everything from the Pyramids to the Suez Canal. Notwithstanding such rumours, for a range of sovereign economic and geo-strategic reasons, Egypt should be concluding a deal with the IMF as soon as possible. To do so, President Morsi will need to corral broad domestic political support, a task which he has so far been unable to do. The IMF deal could therefore be delayed until the next parliamentary elections, which could be as far off as October 2013, after which President Morsi won't need broad domestic political support – simply a majority vote will do. The risk of waiting is that the Egyptian economy will deteriorate further and the government is, therefore, left with fewer economic policy options. The Egyptian government's $1.6 billion a year bread subsidies reform plan amounts to less than 0.5% of GDP, so does not really amount to an alternative economic plan at all. On removing energy subsidies, which could amount to substantial savings, the government must tread carefully as the subsidies affect everyone. Furthermore, energy subsidies are being tabled at a time when the Morsi government has been unable to sustain fuel purchases for power stations (although there is a gas provision from Qatar to help with power shortages), resulting in inevitable power cuts across the country on an almost weekly basis. In Iran, which is probably the best model to look at in reducing fuel subsidies in the Middle East, it took two years to prepare the public and institute an alternative cash payment system which protects the poor. The Egyptian government needs to think more deeply about a possible two-year IMF programme - the loan will not be paid in full upfront, and therefore the government needs to plan for double the current $10 billion shortfall without depending exclusively on debt restructuring, extended borrowing and small subsidy reforms. Of course, extended borrowing is always an option and will more than likely cover all expenditure requirements, but how long before austerity kicks in? A fiscal solution, allowing the devaluation of the Egyptian Pound earlier to avoid the balance of payments crisis which the government now faces, has already proved elusive to the Central Bank of Egypt. Some economic policies, such as spending on the public sector, have also contributed to inflation which, in turn, makes it impossible to cut subsidies. Expanding the Qualifying Industrial Zones (QIZs) is one solution, particularly in attracting states which value duty free status access to the US export market. QIZs have made Turkey one of the largest investors in Egypt. However, the development of the QIZs depends on the attractiveness of the overall proposition (i.e. cooperation with Israel) and whether or not a state has concluded its own Free Trade Agreement (FTA) with the US. This leaves Gulf investors in Egypt left with limited options, except for investing in the existing productive base of real estate, hotels, and services, all areas which do not transfer knowledge to the Egyptian people. An Egyptian - US FTA could help remedy that situation and help create a knowledge economy which provides more jobs and drives economic growth. Given the size of the internal Egyptian market, there is huge potential. Still, the economic solution post-Mubarak continues to rely on resolving ongoing instability and insecurity by engaging with disaffected youth and showing them that it cares, as much as it does on agreeing an economic strategy with the IMF simply to balance to books.